Ultrasound on-line NDT methods have been demonstrated as a useful tool for monitoring the curing reaction of thermosets. In order to achieve this ultrasound sensors are incorporated into compression, injection and RTM (resin transfer) mould. For many commercial products imprints or any surface markings upon the moulded product are undesirable. Due to its physical properties ultrasound has a large advantage over other techniques for similar applications. The sound wave can pass through the wall of the mould and direct contact with the moulded part is not required. In this particular case one fundamental problem is a good coupling of the sensors to the mould wall. Several mediums came into question but because of the high technical (e. g. temperature and long time stability) and practical demands, it was decided that dry (non-fluid) coupling would be the most promising candidate. A handful of coupling foils suitable also at high temperatures and for long time application under industrial conditions were tested and are presented in this paper. Sound velocity and damping undergo characteristic changes during cross linking process of thermosets and offer a good possibility to monitor mould filling and chemical reactions [1-8]. The high potential of ultrasound for on-line process monitoring has led to the development of sensors and PC-based ultrasound equipment . A great advance of ultrasound is that the sound wave can propagate through the wall of the mould. The direct contact between sensor and plastic material does not, as a rule, result in any physical problems. The main priority is that no sensor mark is imprinted on the produced article. Secondly the temperature stability has to be guaranteed as the intention is to employ this system for a wide range of isothermal mould temperatures depending on production technique. Replacement of sensors in a production situation is very cost-intensive and has to be avoided. For sensors placed behind the mould wall the problem of good acoustic coupling must be solved. The simplest idea was to use soft coupling agents like oil or grease. This was rejected because of the necessity of long time stability (for years) of the measuring arrangement at temperatures up to 200 °C and the uncertainty whether the coupling agent would age or evaporate. It's a matter of common knowledge that thin soft metal or Teflon foils can be used as coupling agent . The aim of our investigations was to test different metal and plastic foils for their coupling ability between sensor and mould or metal wall. It was also our intention to use this opportunity to consider the effects of changes on heating and cooling periods on long time stability. We used an arrangement of two longitudinal sensors facing each other and operating in through transmission mode. 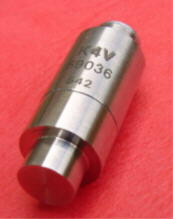 The sensors type K4V were obtained from ISK  and are the same type used for on-line cure monitoring in [1-6,8,9]. In Fig. 1 a photo of the sensor is illustrated. The diameter of the sensor head is 8 mm. 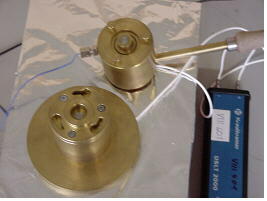 The sensors were mounted on opposing sides of a brass holding device. Fig. 2 shows the schematic arrangement. 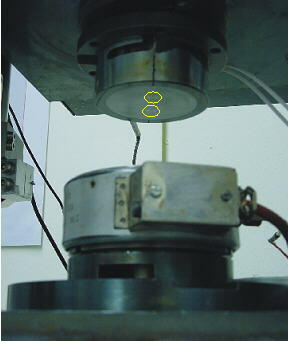 For testing the direct arrangement the sensors were mounted in two cylindrical halves which can be screwed or fixed into each other using a bayonet lock system as shown in Figure 3. The upper half has an internal precision screw similar in principle to a micrometer which enables the upper sensor to move accurately and independently of the fixed stationary sensor in the bottom half. The sensor surface is exactly parellel to the arrangement surface and can be identified in Fig. 3 by the steel colour. Also the high temperature stable coaxial cables connected to the US-box (pulser and pre-amplifier - Krautkrämer/Agfa) are illustrated. A thermocouple wire is situated in the middle of the arrangement - blue wire on the left hand side of Fig. 3. 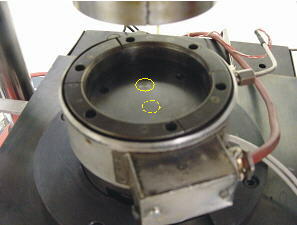 The coupling foils under test are cut as circular disks and placed in the cavity. 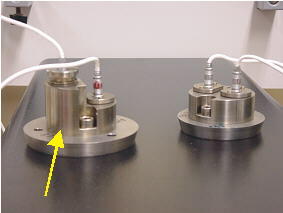 The foil is sandwiched between the two sensors by the weight of the top part - which weighs about 500 g, when the arrangement is closed. 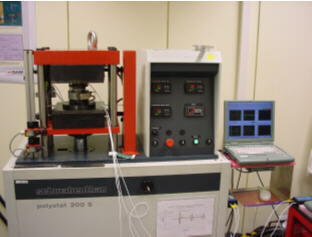 The whole measurement cell stands on a heating plate. Basis of the US-measuring device is a PC with a Krautkrämer/Agfa US-PCMCIA plug in card. With the aid of a special LabView-program the ultrasound pulse signals obtained from the receiving sensor are stored. The evaluated data are the basis for a comparison between the different coupling foils. The whole arrangement is illustrated in Fig. 4. The evaluation of the suitability of coupling foil material will be discussed by evaluating the received pulses, in particular amplitude response. In Fig. 5 an example is given for coupling agent no. 1 (grease). 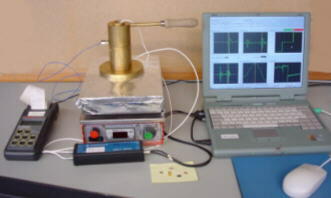 For further evaluation only the first received pulse (from the A-Scan below) is used which travels the shortest distance through the foil and which is undisturbed by reflections. A summary of signals for all coupling foils investigated at room temperature and 130 °C are illustrated in Fig. 6 and 7. For both temperatures the signal amplitude for lead was largest. This was surprising as it was expected that the very thin layer of coupling grease would be better. Evidently the damping in very thin grease layer is higher. The amplitude mean values in either case are summarized for the various foils at room temperature and 130 °C in Fig. 8 and 9. Because of the good results obtained with lead as a coupling medium, the following tests in the mould were performed using the lead foil. The motivation behind these experiments was to simulate industrial conditions. 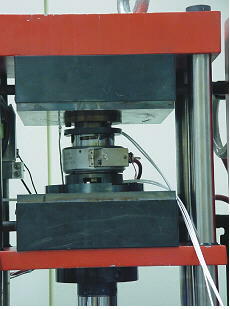 A special tool for compression moulding was constructed. 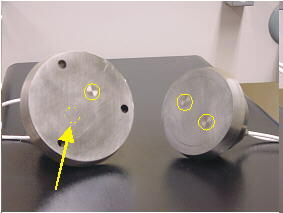 For comparing investigations two parellel ultrasound measuring lines were assembled at close distance: the first with two direct sensors, the second with one direct sensor and one indirect sensor located 10 mm behind the mould wall and coupled via lead foil - named arrangement B (see Fig. 10). The indirect sensor is clamped in a special holder with thread and is mounted using a torque wrench with 40 Nm. 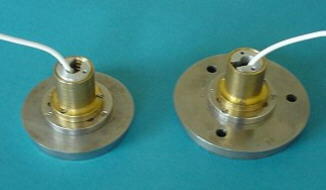 The compression mould was constructed in such a manner that the top and bottom ground plates serving as sensor carrier are removable - see photos in Fig. 11 and 12. The top and bottom ground plates are held in the mould by a bayonet joint - see photos in Fig. 13 and 14. Fig. 15 and 16 show the mould in practical operation . To explain the unexpected difference in amplitude of the two direct sensor arrangement in comparison to the direct-indirect sensor arrangement we believe that the contact area of both measuring zones is a little different. Lead is a soft material. Therefore it is expected that it can creep under loading. This can cause either an improvement or deterioration of coupling quality denoted in amplitude. At room temperature and during 1st heating the amplitude in the direct-indirect sensor arrangement B had the highest value. After that a reduction by about 30% occurred and remained nearly constant during all other experiments. We believe that primary flow of lead occurred reducing the contact pressure. The final aim was the use of two indirect sensors as shown in arrangement C - Fig. 21. A constant mould pressure of approx. 100 bar was employed. For the test with two indirect sensors the ground plates shown in Fig. 22 were constructed. This arrangement was chosen to simulate industrial conditions. The goal was to incorporate several sensor pairs in a large industrial mould to monitor the flow and cure behaviour of cross linking systems. A particular resin cured at 80 °C in a process known as Resin Transfer Moulding (RTM) was under investigation [13,14]. In order to recreate thermal conditions, investigations were carried out with arrangement C at room temperature and 80 °C. In Fig. 23 the signals are represented for six cycles between both temperatures. Apart from small variations, with high probability caused by thermal expansion of delay line and mould wall, the reproducible stability was good. The application of ultrasound sensors behind the mould surface is a realistic option for a material processor. A number of coupling foils for indirect sensors were tested under realistic conditions. Lead foil was selected to be a suitable material for dry-coupling of indirect sensors with the mould wall. Lead is soft and temperature stable. Coupling loss is very low. Obviously during the primary heating a kind of relaxation process takes place. The amplitude reduces one-time. However after this initial thermal aging step the amplitude remains nearly constant even after consecutive heating runs. Foils have the distinct advantage over alternative liquids or coupling medium that they are relatively easy to incorporate into existing large commercial mould, remain temperature stable and problems such as sealing or evaporation do not exist. To summarise, it can be concluded that lead foil was found to be a good coupling material which could be employed for industrial application at elevated mould temperatures. The authors want to thank BAM co-workers: Mr. Jürgen Bartusch, for developing the LabView program of the US measuring equipment, Mr. B. Pott and M. Schneider for making the multitude of sensor holders. Dipl.-Ing. Christian Kürten, ISK-Iserlohn and Dr. Gerhard Splitt, Krautkrämer/Agfa we appreciate for good co-operation during many years. Döring, J. (BAM VIII.401), Stark, W.
Academic Press Boston, San Diego, New York, Berkeley, London, Sydney, Tokyo, Toronto 1989, p. 154 et sqq.